Fly from London to Sydney, arriving the next day. On arrival make your way to your chosen hotel, for a three night stay - we have a range of hotels to choose from, and your length of stay in Sydney is flexible. 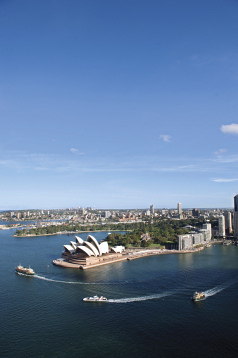 Spend the next few days exploring Sydney - the city centre is fairly compact so getting around is easy, and the Sydney Eye is a great place to start with spectacular views across the city. Collect your rental car from the Sydney depot, and head towards Canberra. Travelling the long way round via the Blue Mountains (approx 450 km / 5 hours, plus stops) will add to your journey time but adds some truly spectacular scenery to your journey. On arrival in to Canberra check in to your hotel for a two night stay. Spend today in the nation’s capital Canberra - sights such as the Australian War Memorial and the National Gallery of Australia should be on any itinerary, while Parliament House can also be explored. We’d suggest travelling from Canberra to Merimbula via the Eurobodalla Coast (approx 325 km / 4 hours 15 mins, plus stops). As you hit the coast Bateman’s Bay offers good beaches and clear waters, while pretty villages such as Mogo and Moruya dot the area. As the Eurobodalla Coast becomes the Sapphire Coast, keep an eye out for Tibla Tilba and Central Tilba with their well-preserved buildings, while national parks such as Mimosa Rocks and Bournda offer quiet beaches and surfing. Merimbula makes a great overnight stop - on arrival check in to your hotel for an overnight stay. Today drive in to Victoria and we’d suggest hugging the coast via Eden and Croajingolong on the way to Lakes Entrance (approx 350 km / 4 hours 30 mins, plus stops). 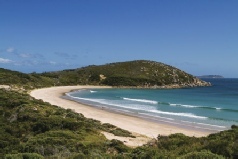 Eden is said to be one of the best places in Australia for whale-spotting (best October & November), while nearby Ben Boyd National Park is dotted with lighthouses, towers and follies. Cross the Victoria border and pop in to Croajingolong National Park, one of the countries best coastal wilderness parks - Mallacoota is a bit of a gem. On arrival in to Lakes Entrance check in to your hotel for a two night stay. Lakes Entrance marks the start of the Gippsland Lakes, the largest inland waterway system in Australia with three main interconnecting lakes. Spend today exploring Lakes Entrance itself or enjoying a cruise in the Lake District. Today drive west towards Traralgon, and we’d really recommend a detour to the famous Ninety Mile Beach (approx 250 km / 3 hours 15 mins, plus stops), an isolated and spectacular beach that’s pretty much unbroken for 90 miles - come off the highway at Sale and head to Golden Beach, follow the beach to Seaspray and head back inland to Sale and onwards to Traralgon. Traralgon itself is a handy stopover point through Gippsland. On arrival check in to your hotel for an overnight stay. Today we’d recommend heading to the most southerly point of mainland Australia at Wilson's Promontory (approx 300 km / 4 hours, plus stops). This is a spectacular national park of hiking trails, coastal scenery and white sand beaches, and well worth the detour. Continue to Phillip Island in time for sunset, when tiny penguins come ashore at the Penguin Parade - take a seat in the amphitheatre for the spectacle, and keep an eye out for stragglers at the end. On arrival check in to your hotel for an overnight stay. Today is an easy drive to Melbourne, but it’s well worth considering a detour to the Mornington Peninsula (approx 255 km / 3 hours 20 mins, plus stops), with its historic towns such as Portsea and Sorrento, and its stunning coastal walks. On arrival in to Melbourne drop off your car at the depot and check in to your hotel for a three night stay. Spend a few days exploring cosmopolitan Melbourne - getting around is easy with the free tram network in the city centre, while the hop-on hop-off sightseeing bus will take you a little further afield, including to historic St Kilda. Make your way to Melbourne airport for your return flight to the UK, arriving the next day. 2019 fly-drive package holidays to Australia Prices are per person based on two sharing, including flights, accommodation and car hire, and are subject to availability.